“This is a great war long-planned, and we are but one piece in it, whatever pride may say. Things move in the far East beyond the Inland Sea, it is reported; and north in Mirkwood and beyond; and south in Harad. And now all realms shall be put to the test." 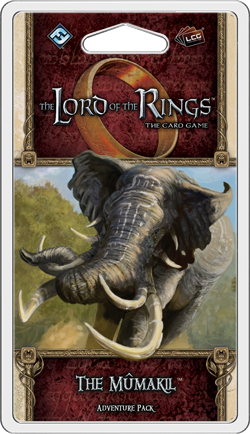 Fantasy Flight Games is proud to announce the upcoming release of The Mûmakil, the first Adventure Pack in the Haradrim cycle for The Lord of the Rings: The Card Game! After surviving their first adventures amid The Sands of Harad, several of Middle-earth's greatest heroes find themselves surrounded by enemies and stranded far from home. Now, with The Mûmakil and the Haradrim cycle, these heroes embark upon the harrowing homeward journey. No roads guide their way, yet they must travel more than five-hundred miles from Far Harad back to the safety of Gondor, along a route that will lead them straight through some of the world's strangest and most dangerous lands. What will come of their travels? As it leads us into the Haradrim cycle, The Mûmakil establishes our heroes' plight and their ambitions. With hundreds of miles of hostile territory between them and their destination, the heroes must be cautious and alert, and they must think carefully about how best to prepare themselves for their journey. So it is that in The Mûmakil we find the heroes heading into the jungles of Harad in order to capture Oliphaunts to serve them as mounts. 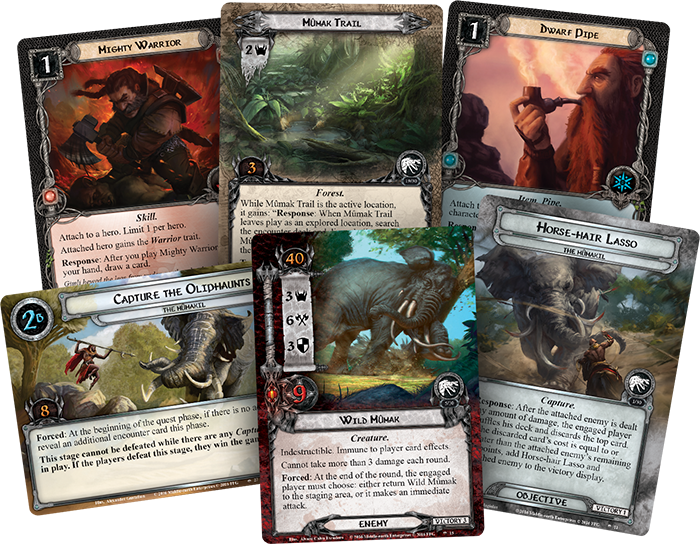 Meanwhile, in addition to the many dangers and surprises of its scenario, The Mûmakil introduces a new hero and three copies each of nine different player cards that develop the cycle's focus on new partnerships. You'll find powerful events that require you to build your fellowship around paired Traits, as well as the opportunity to make allies with some of the Haradrim, themselves. What else might your heroes expect to encounter should they successfully snare and tame their Oliphaunts? Developer Caleb Grace shares more information about the Haradrim cycle. 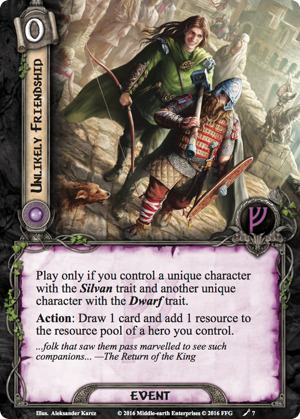 "A couple years ago, the design team decided it would be super fun to take The Lord of the Rings: The Card Game in an unexpected direction with The Grey Havens deluxe expansion, using it and an entire cycle of Adventure Packs to explore the seas and shores of Middle-earth. We mapped out the deluxe expansion and the voyage of the Dream-chaser, and after we decided that it would end in Umbar, we thought that that southern realm would be the perfect jumping off point for the deluxe expansion and cycle to follow. "Rather than beginning another deluxe box with our heroes answering a call to adventure, The Sands of Harad finds them stranded in a distant land and surrounded by enemies at the very beginning of their adventures. After they outpace their pursuers through its scenarios, and survive a desert crossing, the heroes end up with a moment's respite—but even further from home. The Haradrim cycle, then, became the story of how this brave group of adventurers make the long and perilous journey back to Gondor and the safety it offers. And the survivalist nature of this story gives each scenario in the Haradrim cycle a tinge of desperation. It's more than five-hundred miles to Gondor, much of that is inhospitable desert, and each adventure feels like it could be the heroes' last. 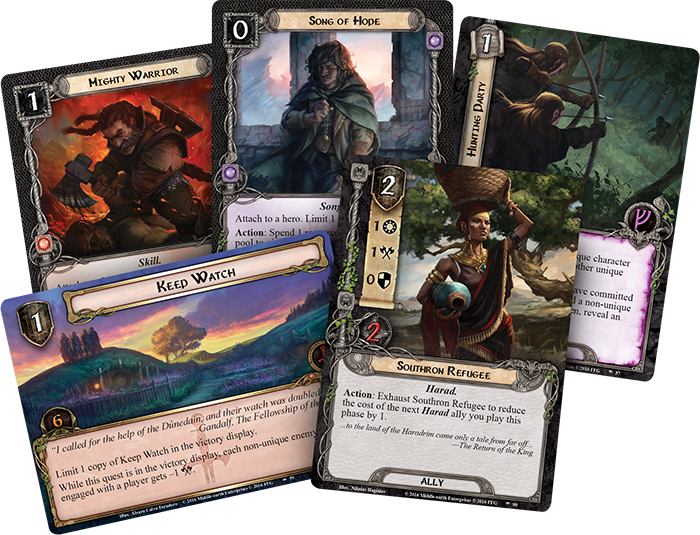 "As the design team was developing these adventures, we were also exploring new design space with the cycle's player cards. One idea we latched onto early in the process was the idea of powerful events that require you to control heroes with different Traits. We felt this would be a fun way to represent the ways that the heroes needed to make allies in a hostile territory and the idea of different types of people coming together to accomplish what neither could do on their own. "We also knew it would challenge current deck-building wisdom by opening up entirely new deck types. No longer is it necessarily best to build around a single trait such as Dwarf, Silvan, or Gondor. 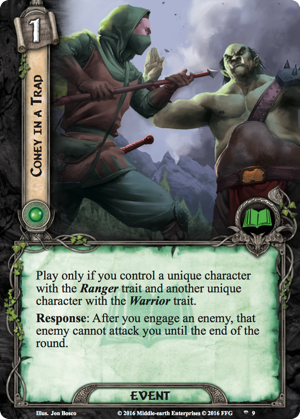 Those decks remain potent, but now players can mix and match those traits and others to gain access to powerful abilities such as Unlikely Friendship (The Sands of Harad, 7) and Coney in a Trap (The Mûmakil, 9). "Finally, the nature of heroes' journey and the idea that they would have to find their way through many miles of strange territory lead us to one of the things we wanted to revisit and promote—player side quests. Players expressed a lot of enthusiasm when side quests were first introduced in The Lost Realm deluxe box, and we thought the time was right to introduce a few more to the game. But this time we wanted them to work just a little differently. Whereas the original player card side quests had high-impact abilities that triggered when they were defeated, the player card side quests in the Haradrim cycle have abilities that work from the victory display after they are completed for the remainder of the game. "For example, once your heroes defeat the side quest, Keep Watch , it reduces the Attack Strength of each non-unique enemy in play by one for the remainder of the game. 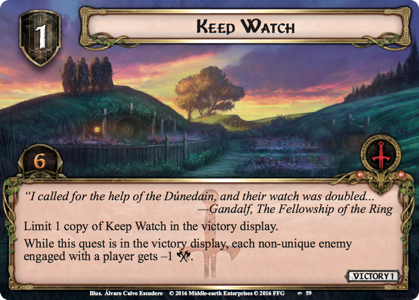 That means once you complete it, Keep Watch will make enemies easier to defend for the rest of the scenario. Additionally, there are several player cards that become more powerful when you complete side quests, including an exciting new Ranger hero! But we can get to that later…"
Can You Survive the Long and Perilous Journey Home? In The Mûmakil, your heroes are—for once—the hunters, given the opportunity to set their traps for some unsuspecting Oliphaunts. However, even caught completely by surprise, a panicked and desperate Oliphaunt is a brutally powerful beast, best approached with care, and there are other dangers in the jungles, as well. Join your heroes for the long and perilous journey back to Gondor when The Mûmakil arrives to retailers in the fourth quarter of 2016!